Based on the UVS model, planetary rings are formed as a result of the polar vortex pair on several higher atmospheric layers of a gaseous planet, have had opened to the extend that they had touched and flattened around the equatorial plane. Note: Despite the planetary rings of Satun have been observed 400 years ago, the causality for planetary rings is still a mystery in astronomy and astrophysics. The cognitive paradox that renders planetary rings as mysterious phenomena, was thus resolved with its underlying structure and mechanism illustrated. From the UVS perspective, the nested polar vortex pair from the two poles of the planet, had compressed several layers of the nested atmosphere into a thin disk as nested flat rings; the vortical effect of the nested polar vortex pair renders the phenomenon of planetary rings. In the Solar System, other than the planetary rings of Saturn could be observed, such mysterious phenomena have also been observed on Jupiter, Uranus and Neptune. The animation at right illustrates the top view of an atmospheric polar vortex with its vortex eye opening on a layer of cyan color atmosphere that has eventually touched the equator plane of its grey color planet. UVS predicates that planetary rings are flattened polar vortex pairs of the outer atmospheric layers of a planet. See the UVS topics on "Atmospheric polar vortex" that elaborates on how an atmospheric polar vortex is formed and impelled, and "The vortices of Jupiter" that illustrates how the nested polar vortex pair was formed on Jupiter. 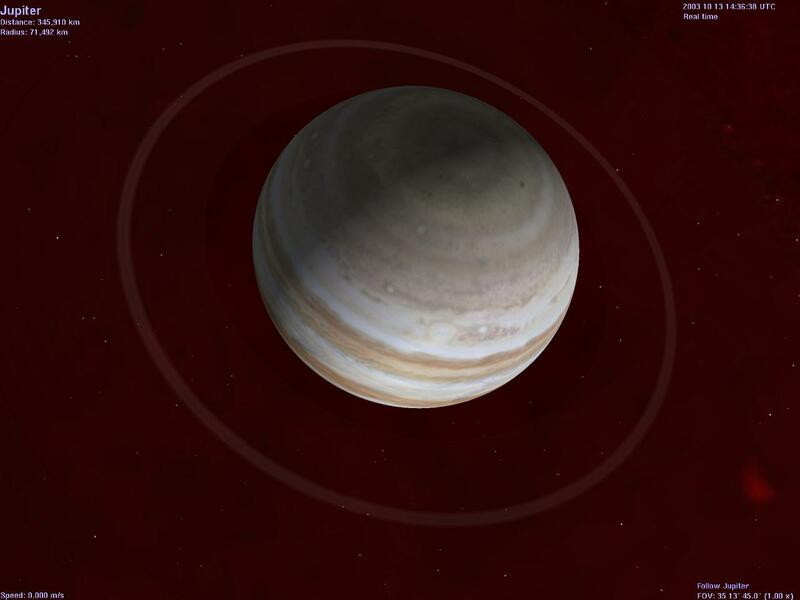 Animated polar view of a 2D grey planet with a cyan color atmosphere, it illustrates a vortically formed planetary ring and shows it by tilting to a side view. "In January and March 2009, astronomers used NASA's Hubble Space Telescope to record Saturn while its rings were edge-on. The result was a rare view of the giant planet's nearly symmetrical auroral shows, seen at both poles simultaneously. It takes Saturn almost 30 years to orbit the sun, and the opportunity to image both poles occurs only twice during that time. After processing the ultraviolet data, NASA released the image on Feb. 15." - Excerpt from Hubble Captures Saturn's Double Light Show. With the underlying structure and mechanism for the nested polar vortex pair of Saturn elucidated, its thus indubitably substantiates as the qualitative proof that the observed planetary rings of Saturn, are formed by their nested polar vortex pair. The grounding for its epistemic theories of truth: The underlying structure and mechanism of a planetary ring as explicated with its hypothetical construct based on the UVS model, elucidated its delusional observation that has been rendering it as mysterious phenomenon. Thus, its cognitive paradox could be meticulously resolved, and all the related natural phenomena were then qualitatively analysed in the conceptual frameworks of UVS by inductive reasoning for explicating with their empirical evidence to predicate by abductive reasoning. Based on the UVS model, a polar aurora is induced and demarcated by its polar vortex of thermosphere. From the UVS perspective, the intensity of a polar vortex of viscous matter is affected by its mass, rotating speed, axis tilt, revolving speed, and the precession effect of the suspended spheroid wobbling in its primary two-axis spin. Perceivably, an invisible flattened atmospheric pause layer that segregates two visible atmospheric layers, would render the phenomenon of a planetary ring. If a pair of nested polar vortex with an invisible atmospheric pause layer are opened from both the polar regions till they touch its equatorial plane, they would form as an innermost planetary ring. Based on unisonal vortex mechanism, the brightness of an aurora depends on its electric current generated by the dynamo effect in magnetohydrodynamics of its vortically culminated plasma that causes ionized matters to glow by electric glow discharge; polar aurorae are vortically impelled to glow by its nested pair of polar vortex. In the UVS worldview, the pair of polar aurorae of a gas giant, is manifested by the vortical motion of its intensified polar vortices. The kinetic energy in matters is converted to thermal energy in the vortical process for its plasma glow at both the polar regions. If the vortical motion of a precessing gas giant is intensified sufficiently to rotate at extremely high speed, it would glow like a star. This suggests that the effect of thermodynamics, is caused by vortical motion of the celestial object, which is impelled by its external vortical system. UVS predicates that aurora glow is caused by the electric current generated by the dynamo effect in magnetohydrodynamics of vortically consolidated plasma. See the UVS topic on "Polar aurora" for more illustrations and further elaboration. Based on the unisonal vortex mechanism, the cloud bands on Saturn are formed as a result of polar vortices on different layers of atmosphere at different altitudes have their vortex eyes opened up till different latitudes, and they are vortically pushed from the poles toward the equator, and their nested vortrexes form the jet streams on the nested atmospheric layer. The image below on left most is the polar vortex of Saturn, and literally hundreds of storm clouds encircle the pole, appearing as dark spots in this infrared spectrometer thermal image. From the UVS perspective, each of these storms is a harmonic unisonal vortex impelled by the precession effect of Saturn. See the UVS topic on "The hexagonal-like cloud structure of Saturn" that elaborates on how its cloud bands are caused by a nested polar vortex pair. See also an externally linked topic on "Vortex alley of Saturn". "The phenomenon is somewhat periodic at 28.5-year intervals, when Saturn's northern hemisphere tilts most toward the Sun. The following is a list of recorded sightings; years with spots generally considered to be part of the cycle are 1876, 1903, 1933, 1960, and 1990." - Excerpt from Wikipedia on "Great White Spot". Based on the UVS model, the Great White Spot on Saturn is a periodically resonated satellite free vortex cluster impelled by a polar vortex of Saturn with the precession effect of its axial tilt. Based on unisonal vortex mechanism, the empirically observed Great White Spot on Saturn triggered by the revolving precession effect of Saturn with its axial tilt, is a cyclonic vortex cluster that was spawned with an intensified jet stream that had manifested on a cloud band. UVS predicates that the Great White Spot on Saturn is a vortex cluster spawned by the revolving precession effect of Saturn with an intensified jet stream periodically manifested by its axial tilt. The cognitive paradox that renders the Great White Spot of Saturn as mysterious phenomena, was thus resolved by the illustration of its underlying mechanism. The fact that the Great White Spot on Saturn is periodically manifested by the effect of its axial tilt as can be empirically observed, and with its underlying mechanism elucidated, it construes as a qualitatively proof that the Great White Spot on Saturn is a vortex cluster spawned by a periodically intensified polar jet stream with the revolving precession effect of Saturn. The Great White Spot on Saturn. See the UVS topics on "Tidal bore" that elaborates on tidal bore events were triggered periodically with an annual precession effect of the Earth, "Tornado" that elaborates on how the axial tilt of Earth could have occasionally triggered a chain of tornado cluster on Earth, and "The vortices of Jupiter" that illustrates how jet streams on Jupiter drives similar vortex clusters in its nested atmosphere. See also externally linked reports on "Moonquakes" that reported on a regular monthly pattern of moonquakes on the Moon, and "Jupiter and Io Observe Each Other" that suggests moon Io undergoes tides and earthquakes on a 42-hour cycle as it orbits Jupiter. Based on the UVS model, all celestial objects are manifested by their vortical systems, and they are impelled by their spheroidal unisonal vortices that encapsulate them. The flattened nested polar vortex pairs of a celestial object manifest its ring system. From the UVS perspective, in a comparative analysis for planetary ring system on a larger scale, the asteroid belt and the Kuiper belt are the vortical ring systems of the barycenter of the Solar System (BOTSS). UVS predicates that the ring system of a celestial object are vortically formed by resonated motion of the nested celestial object with its flattened nested polar vortex pair. See the UVS topics on "Heliosphere", "Globular cluster", and "The formation of stars and galaxies" that elaborate on all sorts of manifested ring system in celestial objects. See an externally linked topic on "First-Ever Asteroid With Rings Knocks Astronomers for a Loop" that reports on a discovery for the first asteroid with rings. ~ With thanks to Graham Burnett (aka G_burnett of TOEQuest Forum) for his post #817 that shows a symmetrical pair of polar aurorae at both polar regions. ~ With thanks to anonymous from Singapore and Professor Christopher W. Hodshire from Western Michigan University (on March 27th, 2014) for their information of the report on "First-Ever Asteroid With Rings Knocks Astronomers for a Loop". Thermal image of Saturn - credit NASA/JPL/Space Science Institute/University of Arizona.